A data driven re-design for Kiehl’s results in an immediate 7% increase in sales. 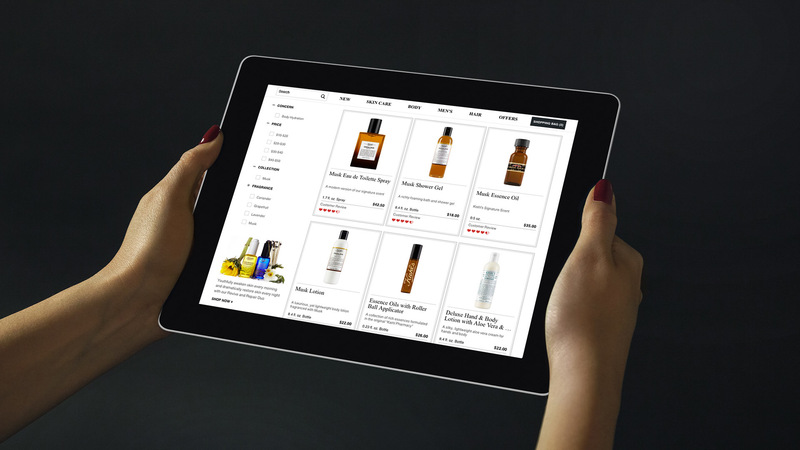 How can we further optimize the highest performing e-commerce platform in the L’Oréal Luxe portfolio? Targeted optimizations: By making search more prominent, we helped connect users to the products they wanted faster than ever. Design System: From homepage to cart, we designed hundreds of new pages. Product Bundles: We created special product pages to make it easy for users to buy both bundles and individual items from the same page. Product Landing Pages: Design enhancements included creating a sticky navigation to improve the overall user experience. Global Consistency: From skincare to fragrance, we created consistency across the product pages to accommodate all types of products. Online sales for Kiehl’s continued to increase, but we saw an opportunity to enhance the site and drive growth even further. 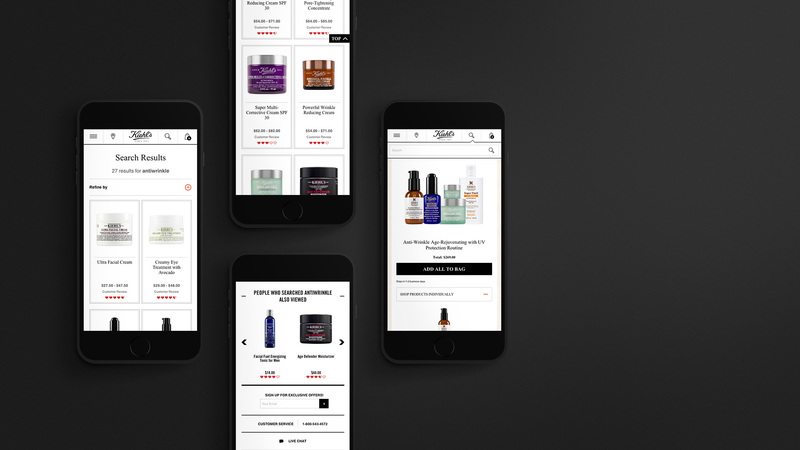 While we made optimizations across the ecommerce experience, we specifically focused on how we could use mobile to increase sales. For starters, we created a data strategy that informed the UX and design. This allowed us to overhaul the site’s purchase funnel, resulting in an immediate increase in mobile engagement, and of course, sales. The visual design of the branded experience was also important. 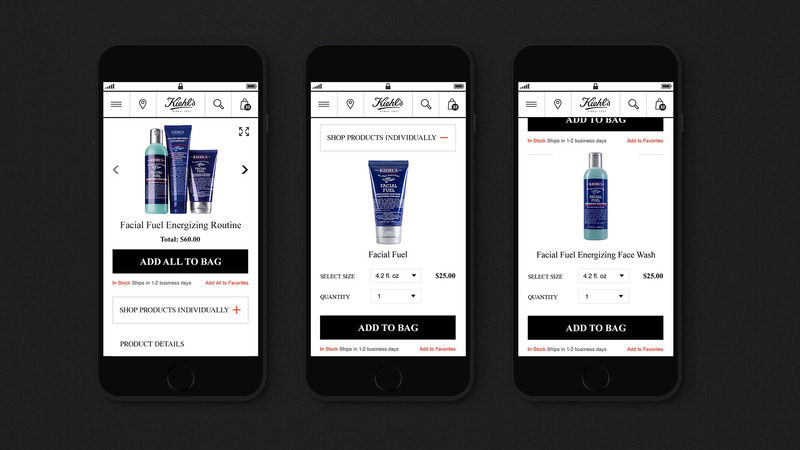 In order to ensure that users felt they were getting the same Kiehl’s premium experience across all devices, we seamlessly connected the mobile presence to the desktop site and made designs responsive for tablet and mobile. Finally, targeted optimizations, like increasing the prominence of search, also helped connect users to the products they wanted faster. Updating the bundle purchasing flow also made it easy for users to buy both bundles and individual items from the same page. Because the combination of these data and design optimizations was so incredibly successful, Kiehl’s asked us to use the US site as a base template for creating their global flagship online presence. The redesign drove an immediate 7% increase in net sales and 24% increase in U.S. sessions within the first three months post-relaunch. Mobile phone engagement also increased driving a 74% increase in new buyers to the mobile site. 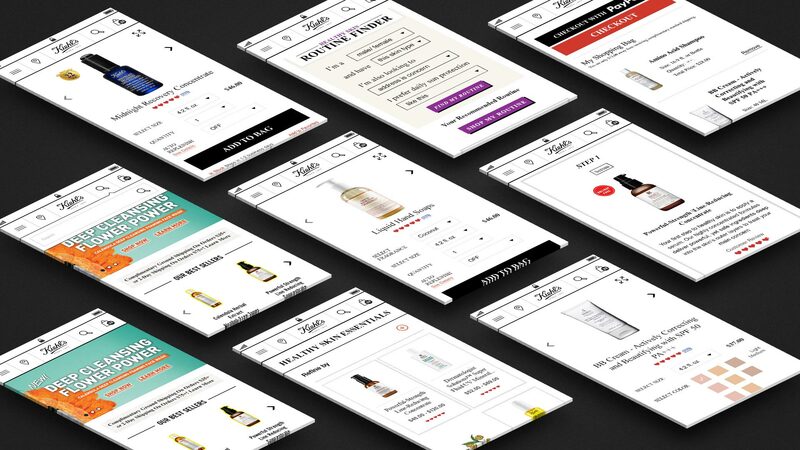 Already the highest performing e-commerce platform in the L’Oréal Luxe portfolio, kiehls.com’s online sales continued to increase, but we saw an opportunity to optimize the site to drive growth even further by better serving its mobile audience. Among the many details that required refreshing, we wanted to seamlessly connect the mobile presence to the desktop site. By creating a data strategy that informed the UX and design, we were able to overhaul the site’s purchase funnel, resulting in an immediate 7% increase in net sales and 24% increase in U.S. sessions within the first three months post-relaunch. Mobile phone engagement also increased driving a 74% increase in new buyers to the mobile site. We reimagined the experience, designing a completely new and responsive site based on the desktop view. Each page was created from scratch, altogether encompassing over 300 differentiating design pages. 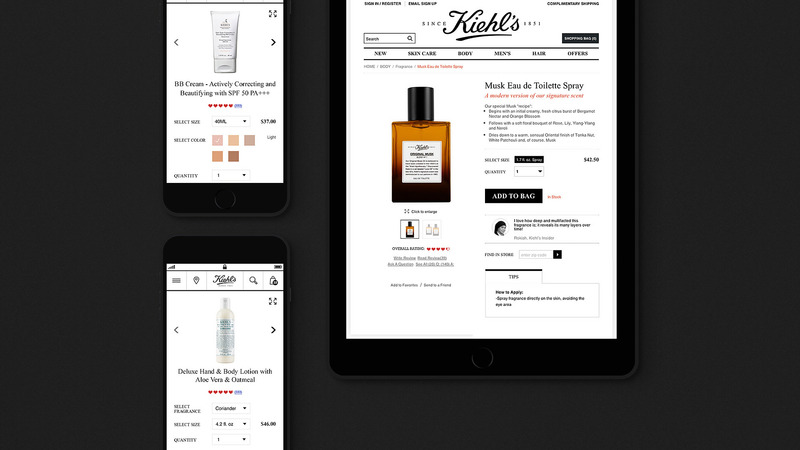 Partnering with L’Oréal IT and the Demandware vendor to deliver a smooth integration, the site is now easier for people to find specific products and to explore other Kiehl’s offerings.